Algeria’s North African neighbours are considering increasing security measures around their oil and gas plants as foreign energy workers continue to be evacuated from Algeria Sunday. The Libyan Defense Ministry said it had deployed additional guards and troops in and around its oil and gas facilities. “Due to events in the region, the Petroleum Faculty Guard has taken a series of actions to enhance and reinforce the protection of oilfields, facilities and employees in the western and southern regions of Libya,” it said in a statement carried by Reuters. 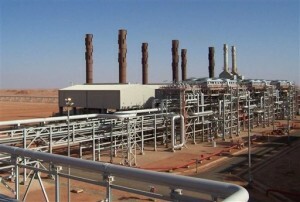 A group believed to be working under Al-Qaeda in the Maghreb launched an attack on the Amenas gas processing plant in southeastern Algeria, near the Libyan border on Wednesday. The group first attacked two buses carrying workers before attacking the plant itself and seizing more than 130 hostages, many of whom were foreigners. This led to a standoff which ended only after Algerian Special Forces stormed the plant and killed many of the captors Saturday. An unknown number of hostages were also killed. Recent violence in post-Qaddafi Libya has lead to instability in some regions in the country, creating vacuums that have been usurped by militias, some of which have ties to Al-Qaeda. Since Egyptian President Hosni Mubarak’s ouster in February 2011, Cairo has also faced violence from militias and Al-Qaeda affiliated groups in its Sinai peninsula. Last week, a police convoy of four trucks patrolling near vital pipelines, which transport oil to Jordan, came under attack by suspected militants. A senior officer and his troops were wounded in the incident. In December 2012, several soldiers were killed after unknown gunmen fired on their patrol. In August, 16 Egyptian soldiers were killed by unknown militia near the border with the Gaza Strip. A month later, UN peacekeepers in the Sinai were also attacked. Authorities in Cairo say there have been nearly a dozen attacks on gas pipelines or police outposts guarding them in the past two years.